Bumper Repair & Paint - Auto Renew LLC. 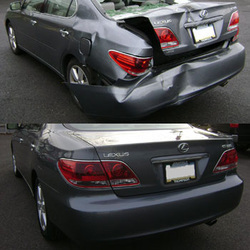 Experience how easy and convenient repairing your damaged bumper can be! Many repair shops will tell you that your damaged bumper needs to replaced, or at least removed and re-installed, resulting in a much higher cost than a professional repair at Auto Renew. We are able to repair your vehicle for less simply because we use innovative techniques that are not widely known in the industry, saving you time and money while giving you the results you are looking for! Auto Renew uses only the highest quality paints and sealants available on the market to keep your car looking like new, and we guarantee all paint work for as long as you own your vehicle.